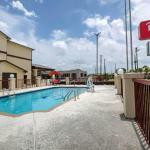 Free Wi-Fi well-appointed rooms and a pool await guests near I-10 at the Red Roof Inn & Suites Mobile - Tillman's Corner. All 46 rooms at the three-story Red Roof Inn & Suites Mobile - Tillman's Corner welcome guests with the comforts of home including free Wi-Fi coffeemakers microwaves and mini-fridges. Some also include jetted tubs and non-smoking rooms are available. Wake up each morning to enjoy the complimentary breakfast spread. During warmer temps swim in the seasonal outdoor pool. On-site parking is free and pets are allowed with some restrictions. Off I-10 the Tillman's Corner hotel is a half-mile from the Cloverleaf Plaza Shopping Center and seven miles from Hank Aaron Stadium. Downtown Mobile a 12-mile drive is home to the Mobile Civic Center and the History Museum while the USS Alabama holds court 13 miles away. Flights can be reached at Mobile Regional Airport 11 miles north.